I keep missing Gaelynn Lea’s shows… and missing the opportunity to post about them. With her return to London for another gig this season, I’ve got a chance to catch up. A classically-trained twenty-year veteran of violin playing whose limbs have been shortened from birth by osteogenesis imperfecta, Gaelynn plays her fiddle like a cello and sings original songs drawing from the well of traditional American, Irish, Scottish and English folk sources and blending them with her own ideas and experience. Her wistful honey-gravelled singing, her songwriting artistry and her textured playing (supplemented by improvisation and loop-pedal) is powerful and universal enough to have won NPR Music’s 2016 Tiny Desk Contest, seeing off competition from around six thousand other American songwriters and performers. Meanwhile, her performance presence and physical courage have moved audiences to tears and applause in her native Minnesota and across American and Europe (and have won her both admiration and a shared stage from Low’s Alan Sparhawk, country bluesman Charlie Parr, and New Acoustic touchstyle guitar star Billy McLaughlin). 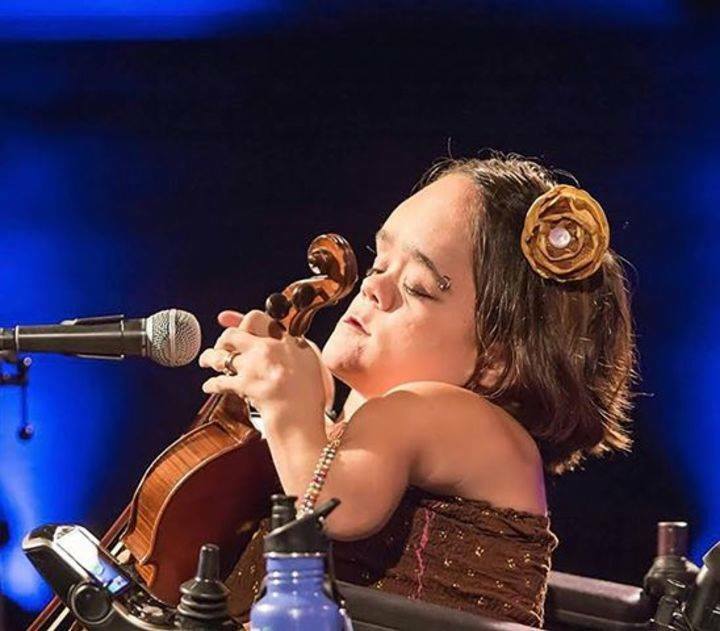 In addition to her musicality, Gaelynn is a powerful disability community advocate – speaking and blogging forthrightly and fearlessly about iniquities and the need for social change to accommodate and support disabled people, and covering subjects from everyday practical challenges to the expression and enjoyment of sexuality. Come for the music, stay for the strength; maybe leave with the encouragement to help make things better. 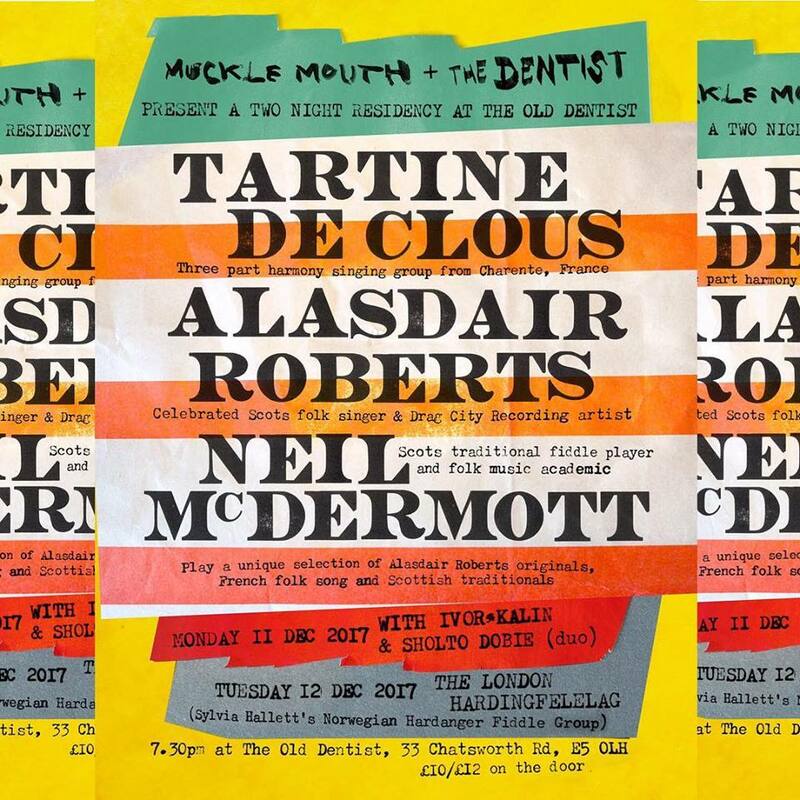 “We are honoured to host a very special collaboration between French harmony-singing trio Tartine de Clous, legendary Scottish guitarist and folk singer Alasdair Roberts and fellow Glasgwegian fiddler Neil McDermott over two nights at The Old Dentist following their residency at Cube Microplex in Bristol. “Tartine de Clous (Geoffroy Dudouit, Thomas Georget and Guillaume Maupin) are a singing trio originally from the department of Charente in western France. Following in the footsteps of some of the great French groups of the late twentieth century folk revival (such as Mélusine and La Bamboche), they sing largely unaccompanied three-part harmony arrangements of the traditional songs of their native land. “In an echo of The Auld Alliance, Tartine de Clous will perform in collaboration with the Scottish songwriter, guitarist and folk singer Alasdair Roberts and his fellow Glaswegian, fiddler Neil McDermott over two nights at The Old Dentist. Alasdair has worked with Drag City Records for some twenty years, releasing records featuring both interpretations of traditional songs and those featuring his own songwriting. In addition to being a fine fiddler in the Scottish traditional style, Neil McDermott is currently researching the musical and political engagement of the 1960s Scottish folk scene with the anti-nuclear movement. 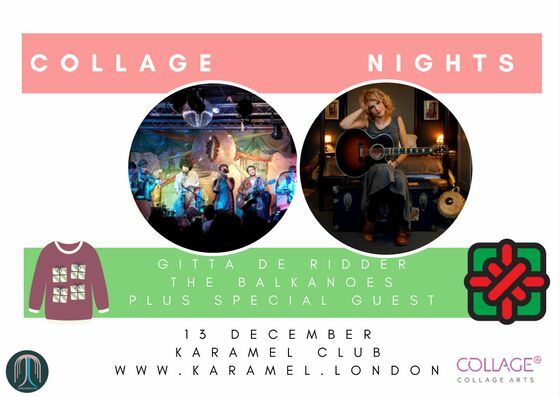 I caught up with the Collage Nights shows in Wood Green last month, just in time to learn about the final two gigs in their season. The last one rolls around mid-month, featuring Dutch-English singer-songwriter Gitta de Ridder and Balkan-styled party band The Balkanoes. Gitta’s debut album ‘Feathers’ came out last year. With its songs of family, friends and lovers (as opposed to hill gods, surreal landscapes or twisted urban short stories) it has a conventional tinge for the current time, but the delight is in the detail and the musicality. She’s a Joni Mitchell disciple less in the sense of pursuing the confessional or the coffee-table mope, more in the delightful flowering of orchestral chords and cats-cradle harmonies (as well as in her domestic wit). As for the Balkanoes, they provide the standard pellmell Eastern European spaghetti-junction of Greek, Ottoman, Slavic and Romani musical threads, but have been known to career off into ‘Star Wars’ covers as well. There’s also a special guest, but they’re keeping quiet about who that might be.